The stem is slightly erect and fleshy. The leaves are heart-shaped, shiny, and with rounded bases. The flower head is clustered and composed of up to 25 flowers. The flowers are lilac or violet-blue. The roots are submerged under water or rooted in the mud and the rest parts are above the water surface. 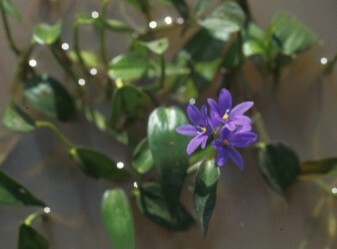 The plant is propagated by seeds or whole plants. Monochoria can reduce rice yield as high as 82%, when left uncontrolled. Sixty individual plants/sq. m. can reduce yield by up to 35% (Rice IPM, 2001). In India, the plant is used as vegetable and the roots are used for medicinal purposes. Studies show that when the weeds infest some rice fields in South Korea, they are found to be resistant to Bensulfuron-methyl (Weed Science, 2005).